Brice Taylor might not be on Aleni Callan's Christmas list, but she finds him under her tree anyway. Nurse Aleni Callan's anger toward God is fueled when Brice Taylor enters her life. Not only does Brice have no regard for his own life—as evidenced by the concussion and hypothermia he suffers after participating in the Polar Bear Plunge—he escaped the war in Afghanistan and lived to tell his story in a bestselling book, while her precious husband was killed. But little does Aleni know that God’s will can be orchestrated in all kinds of ways…sometimes through a meddling but loveable mother-in-law who conspires with Brice and Aleni’s son, Tyler, to force her from a lonely, bitter life. 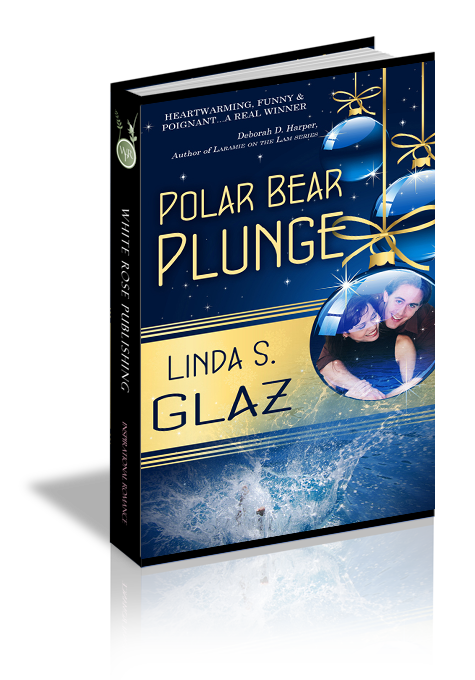 “What kind of person voluntarily dives into thirty-three degree water in the middle of winter?” Aleni plunged the syringe into the warm IV line and rolled her eyes. “A hot one.” Christie smiled at the blue-lipped patient sprawled across the bed as she checked his vitals once again. “Guess he should have been even hotter.” She giggled. He might be offended enough to report her. Too many more double shifts and she’d be on the lookout for another job. Ho, ho, ho. And that wouldn’t help her take care of Ty. “Isn’t the Polar Bear Plunge usually in January?” Christie’s face scrunched into a frown. “Well, cold water didn’t hurt this specimen. Even with a tinge of blue, he’s hot, hot, hot.” Christie shook her head, the bells at the end of her elf hat ringing a tune, while her eyes honed in on the pale face. Waving her hand to shoo Christie out of the room, Aleni scowled. “Don’t you have some decorating to do? I think we’ve both said more than enough. You go check on Mr. Hartway.” She grinned, recalling poor, old Mr. Hartway and his antics. While he couldn’t help it, he made one huge mess each time he pitched a fit—or a bedpan. “Where is he?” The doorway filled with a woman in an over-sized parka. “Where’s who? Ma’am, you don’t belong in here.” Aleni plopped the syringe into the biohazard safety box and headed for the door. Too late, the woman had moved directly to the man’s bedside. She held her cell phone near his face. “Oh, no. Give him his privacy.” Aleni placed her hand in front of the phone. Well, this guy was no old coot. Not by a long shot. His chart said thirty-four. Mind back on business. “Right now, all we care about is getting Mr. Taylor back to health. You’ll have to leave or I’ll call security.” Aleni moved to scoot the woman out of the room. “Want him all to yourself, huh?” The reporter dropped her cell in her pocket. “Just another patient with a seven-figure bulge in his wallet.” Lansing’s eyes sparkled like diamonds. “If I’m not mistaken, the money went to buying flak jackets for servicemen and women who replaced his old unit.” Aleni picked up the chart again. Of course. Brice Taylor. A hero in many more ways than one. Celebrities created monsters out of normal people. She’d expected Christie’s response. Single and eager, Christie viewed every man as a potential husband, but all the ER nurses had poked their heads in the room after shift ended. With so many red hats, the room had looked like a gathering of department store Santas. Even the doctors had pointed and whispered. What were the odds the Iraqi war hero, the man the media called Capt. Available, would find himself in Bayview Regional Hospital? In this condition, he certainly looked nothing like his military photos. To Aleni, hero or not, her job was to think of him as simply another patient. He could be President of the United States for all she cared. The fact was, no one mattered since Eli’s death. “Water?” Mouth like cotton and head about to burst, Brice stuck his tongue between his lips. Porcupine quills rubbed across them. Mind thick and heavy, he fought the drowsiness for some reason. What little detail was he forgetting? “Wait!” The words didn’t form right. He struggled to sit, but she pushed him back with soft hands and no effort.